Twitter has just announced that Vine – a service for recording and sharing short videos with your friends – is now available on Apple devices (but will eventually be available for other operating systems). You can share and view them with a link from within Twitter itself, or from the timeline within the app. Essentially, you change your 140 character limit for six seconds of video. You can register for the service and begin using it right away by entering your email address or your Twitter account. Recording your video is as simple as touching the screen to start recording, and releasing when you want to stop. So, you can create six-second videograms, looping videos, or short, stop-motion animations. You can publish your creation on your Vine timeline, on Twitter, or on Facebook, in addition to being able to set your location using FourSquare. The service isn’t very different from the microblogging website that we’re used to. In fact, the videos integrate perfectly with the native Twitter app, which plays them without any problem from within the official web app. It is a minimalist approach when compared to the short phrases of condensed information in the field of multimedia, where Twitter reigns. Six seconds of looped video goes far, especially when animated GIFs has resurfaced and is back in fashion. 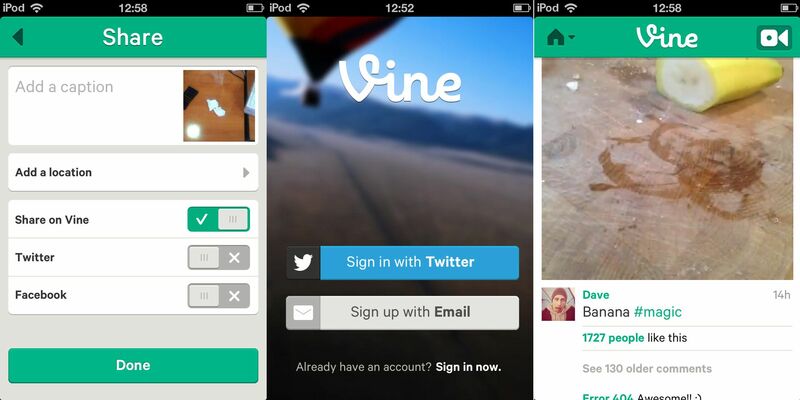 Will Vines become as popular as Tweets? Time, and how often users actually users the service, will tell. Next articleWill there be an iPhone 5S next June?